While we hung out in the never-ending Tahoe snow last weekend, TMS friend Brit Crezee took a trip down to the Sea Otter Classic and wrote up this report for us – thanks Brit! Last Friday I waved goodbye to Truckee and the six feet of snow in the yard and headed south for the Sea Otter Classic at Lugana Seca Raceway. After a 700-inch winter, Monterey sunshine was a welcome treat. As the ski and bike worlds are a bit incestual by nature, it was no surprise to see so many Tahoe folks representing as competitors, vendors and Joe Shmoes (like me) who just needed a break from winter. Local nonprofit Biking for a Better World snagged this video (edited by the fabulous Emily Turner) so be sure to check it out. You don’t want to miss the sick action! Every year, Sea Otter kicks off the West Coast riding scene with a four-day cornucopia of all things bike. The event has something on tap for everyone from roadies and downhillers to dirt jumpers. The event draws top pros and beginners alike with competitive classes for almost every discipline. The massive vendor expo is like a candy shop for gear heads and industry hobnobbers. But you don’t have to be a competitor or a hard-core bike junkie to enjoy this event. For families and groms, Sea Otter offers kids races and a mini bike play zone not to mention a handful of free bounce houses and kid friendly activities (hint to parents: the Sierra Nevada booth is nearby). 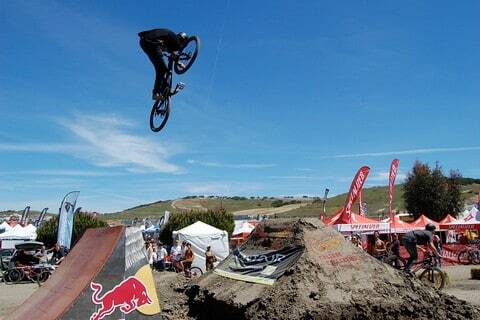 For spectators, there were trials and mountain bike stunt demos. Camp of Champions out of Whistler pumped up the crowd with a Big Air Bag exhibit. H5 Events and Red Bull hosted a rocking dirt jump contest and the speed and style track made a sweet addition to the daily scene. Expo-goers earned swag by competing in arm wrestling, extreme musical chairs and other wacky contests. I walked away with a new “peanut butter spreader.” This was a personal first in the swag department but my well-concealed excitement confirmed for me that parenthood has officially killed any bit of “cool” left in my blood. So after a healthy dose of sunshine and some chill time by the sea, the annual pilgrimage to Sea Otter reminds us that bike season isn’t gone forever. It just might be a while before we’re back in the saddle at Tahoe. The Tahoe Mountain Sports Adventure of the Week blog series takes a walk (or hike, surf, climb, bike or Sea Otter Classic trip) in someone else’s shoes, from pro athletes to local Tahoe adventurers. Let us know if you’ve got an adventure to share.